This creme repairs, protects, nourishes and softens the skin. Makes your skin feel the relief from tightness and redness. Brilliant face cream... gives a brightness to your skin that no other skin cream gives. I have been using this cream for some years and as someone who has suffered from eczema and severe allergic reactions, it is brilliant to find a cream I can use, particularly on my face. Mostly I have to use solutions which have no perfume so it is wonderful to find I can use this Guinot Creme in confidence and appreciate the lovely perfume. 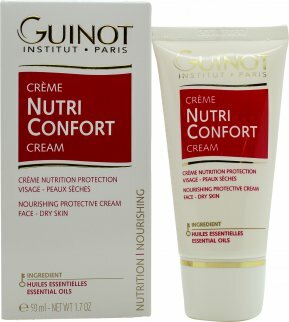 Guinot Creme Nutrition Confort Continuous Nourishing and Protection Face Cream 50ml - Dry SkinHigh Quality Hydrating Cream! This cream really is of high quality as you would expect from Guinot. I had some dry areas of skin on my face and after a week of using this cream my skin is now lovely and soft, it really does hydrate the skin and I would highly recommend it.